This is a recipe that I had jotted down a long time back from one of the magazines that I had borrowed from my local library. In the hustle and bustle of life, the scrap of paper on which the recipe was noted disappeared, and was completely forgotten about. It resurfaced recently when I was looking for something else and I decided to make it and post it ASAP. I have modified the original recipe to such an extent that my recipe now looks nothing like the original! Heat the oil in a pan, add the onions and dried herbs followed by garlic and mix well. Allow the onion mixture to cool and grind to a paste. In a bowl mix together the mayo and the yogurt. Add the onion paste to the yogurt-mayo mixture followed by lemon juice, salt and pepper and mix well. Chill and serve as a dip with your choice of raw veggies, chips or crackers or just slather on bread. Off this goes to Radhika at Radhi’s Kitchen for JFI: Onion. For an Indian version, do check out this Onion Chutney. can we use any onions to make this dip? i want to give it a try. I'm bought. I simply love caramelized onions and that looks so creamy and good TBC. Lovely recipe & very easy too. I love caramalized onions bcs of the lovely flavour. 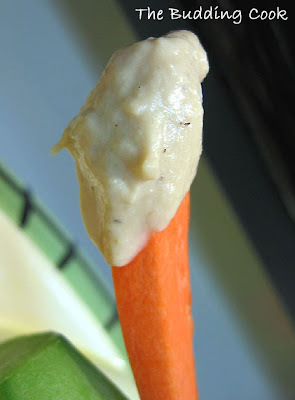 A dip made with caramalized onions......sounds really really delish. 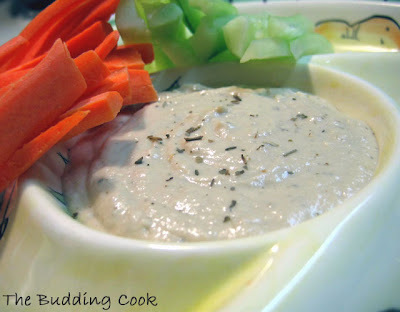 I have been in a mood to consume loads of veggies with some good dips. Your recipe makes me more firm.....thanks so much dear. TBC, Thats a lovely entry to JFI . a unique recipe too ! thanks for sharing . I will have to try this - love dips and my husband loves onions! This is so wonderful. You have definitely come up with a wonderful recipe. I love this. Its also very easy to prepare. Thanks for the recipe. yum! how good does that look...so trying this out.. I dunno' what the original recipe was, but i am totally in love with your version! This is gonna' rock with baked vegetables! I am drooling, while thinking about the flavor and the aroma! Dip looks so good. I love that fact that you have used low fat ingredients wherever posiible. I'll plan to make this for some party so that everybody enjoys it. Looks so yummy. wow, great recipe TBC, and beautiful pictures too! Just noticed this jaunty carrot stick pic, and its attitude amuses me no end! I'm going to howl myself laughing to sleep tonight now! amusing for sure. The pictures look so very tempting. Great clicks! Thyme and mint am sure must be nutralizing the strong onion flavor. Lovely recipe. Thanks or sharing.